Roll each loaf of dough into a rectangle about 8 inches by 12 inches. Layer ham and salami down the center of each rolled loaf lengthwise. Top meats with 1 cup shredded mozzarella for each roll. Fold short ends of each loaf in about 1/2 inch and seal. Roll from the long sides and pinch well to seal the entire loaf. You should have 2 long rolls. Bake, seam side down on a greased baking sheet in a 375 degree F oven for 20 minutes or until golden brown. 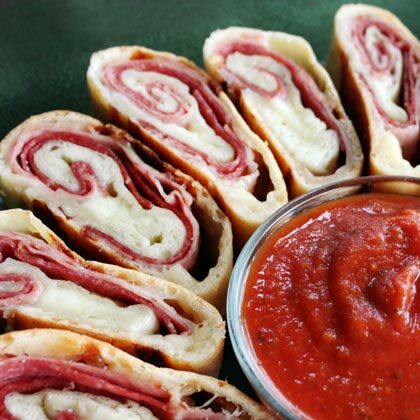 Cut each roll into 8 slices and serve with marinara for dipping.